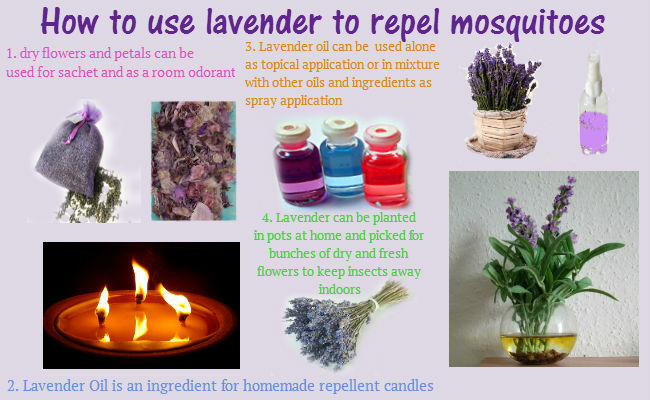 Does Lavender Oil repel Mosquitoes? plant this odorous herb in yard and around the foundation. pick some fresh lavender flowers and rub their skin in “pulse points” on the neck, arms, leggs, behind ears while gardening or being outdoors. buy pure essential oil extracted from lavender and apply it topically to the skin or use it to make mosquito repellent sprays and candles. In fact, lavender oil is widely used in various recipes against pesky insects. Though, this oil burns poorly in candle and doesn’t distribute well when sprayed. In practice, the best results come when this oil is applied directly on the skin. The great advantage of using lavender oil over chemical or synthetic repellents is that it is natural and shows medicinal effect as well. In fact, lavender oil nourishes the skin, soothes mosquito bites, treats swellings and eases itching. 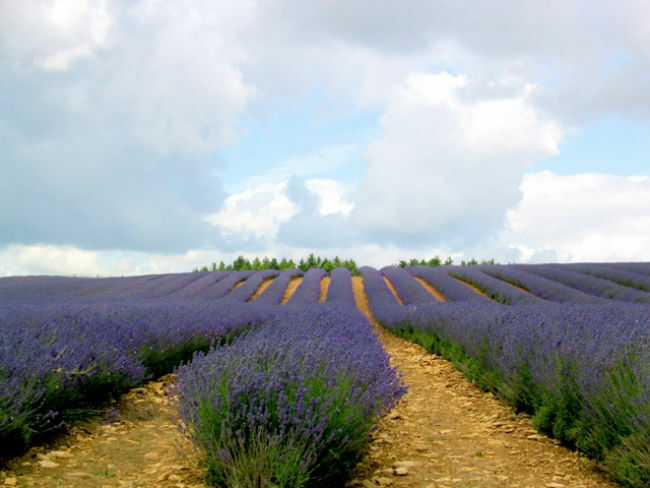 Besides, the odor of lavender is so pleasant that can serve as a relax remedy that encourages sleep. Though, as any other products, Lavender oil can be sensitive to your skin, test the product in advance. To keep mosquitoes away, you should apply Lavender Oil in the perfume-like mode on the pulse points. If you don’t know where the pulse points are, just anoint the oil over the ankles and wrists, under the ears, at the shoulders. Before applying any solution with Lavender oil, test the repellent on the inner elbow for 24 hours to watch for reaction, as it can be skin sensitive! If you don’t have allergy to the oil, though your skin is sensitive, we recommend to add some drops of Lavender Oil to any aqueous cream or lotion and then apply . Besides, use essential oils of citronella, mint, eucalyptus and lavender for mosquito repellent candles that can deter pesky biting insects when burned. To make a homemade lavender candle, you need wax or old candles and oil extracted from lavender. Cut candles or wax into small pieces and melt them in a double boiler or in a bowl that covers a pan of warm water (“a boiling-water bath”). Then, add 5 to 10 drops of lavender oil for each medium sized candle. Pour the candle wax into bottles, cans, or candle molds with wicks. Afterwards, leave the lavender scented candles to set in a warm place. Burn candles outside to deter blood-sucking pests. Furthermore, you can read how to make anti mosquito candles with citronella and lavender oils here. Mix Lavender Oil with other essential oils that repel biting insects to make mosquito repellent DIY. These topical sprays are inexpensive, easy to mix and to apply. 10 drops of citronella oil. Pour the cup of water into a spray bottle and drop the essential oils in, shake the ingredients very well. Cap the bottle and allow to sit for 2 hours before using. Then, apply this spray with lavender for mosquito repellent on exposed areas of skin before going out. Take the ingredients and shake well. Apply lavender mosquito repellent on exposed areas of skin before going outdoors. In addition, store in fridge for 3 -4 days. Take the ingredients, mix them and shake. Spray lavender mosquito body repellent on exposed skin before going outdoors. Add Lavender oil to the olive oil. Apply mosquito repellant ddirectly to the exposed skin before leaving home. Add the drops of essential oils of lavender, citronella and lemongrass into a spray bottle with witch hazel. Cap the bottle and shake well. Spray on skin before walking out. 5 drops of Lemon Oil. Pour the cup of water into a spray bottle and add some drops of the essential oils, shake very well. Then, cap the bottle and allow to sit for 2-3 hours before using. Apply spray with lavender for mosquito repellent effect on the skin exposed to open before going out. Plant lavender in pots at home, make lavender sachet from the dried-out petals and flowers and hang or put in the vases some bunches of fresh and dry lavender to keep the pesky blood-sucking insects away indoors. Indeed, the means of using lavender for mosquito repellent have varying levels of effectiveness. Some methods (lavender candles, sprays, creams, oil for topical application ) will be pointful outdoors, others (lavender in pots, bunches and sachet) are intended for indoors.